Founded over 17 years ago by established industry executives, our knowledge of the marketplace, backed by years of experience gives us a unique perspective to solve the challenges that face companies today. At Office Essentials we challenge businesses to think differently. Every office faces a unique set of challenges and goals. So we work with you to find the most efficient and effective solutions for your business’ needs. We know what makes offices tick and craft innovative, custom programs and solutions to ensure your business goals and employees are not just satisfied, but thrilled. At Office Essentials you get the unbeatable service advantage of an attentive, local provider backed by the power of nationwide delivery. That means quick responses and next-day delivery from account managers and drivers who know you, your company, your preferences and your community. 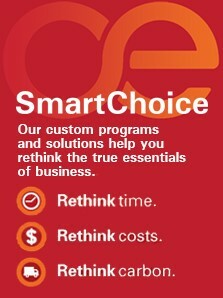 We developed our SmartChoice program to help businesses focus on the true essentials: cutting time, costs and carbon. We work with you to develop a unique plan for your business. By touring and analyzing your product usage, order and delivery processes, invoice preferences and recycling practices, we unearth small steps your business can take to save big.